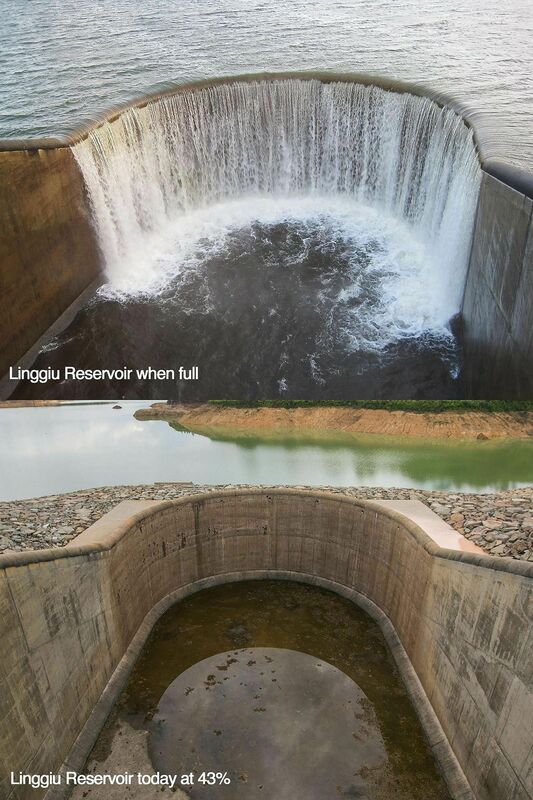 Monday's two-hour downpour which caused massive floods in parts of Johor Baru has done little to raise historically low water levels in the Linggiu Reservoir - a key cog in Singapore's water supply. National water agency PUB said it will continue to monitor the situation closely, and Singaporeans will be told early if there is a need to restrict water use here. "The heavy rain and subsequent floods in JB are in a different catchment area from the Linggiu Reservoir, which is further upstream," a PUB spokesman told The Straits Times yesterday. "While there has been some rain in the Linggiu Reservoir catchment, the water levels remain largely the same, at around 43 per cent." The water level at the reservoir is at its lowest due to low rainfall and this in turn impacts how much Singapore can draw from the Johor River. Singapore can tap 250 million gallons of water a day from the river, which can meet up to 60 per cent of the country's needs. PUB said that from January to last month, there were about 100 times when Singapore was temporarily unable to withdraw water from the river . The heavy rain and subsequent floods in Johor Baru are in a different catchment area from the Linggiu Reservoir, which is further upstream. While there has been some rain in the Linggiu Reservoir catchment, the water levels remain largely the same, at around 43 per cent. Last week, Minister for the Environment and Water Resources Masagos Zulkifli said if the situation does not improve, more may have to be done to conserve water. This includes restricting, for the first time, the use of water for non-essential activities such as washing cars and operating water fountains. Senior research fellow Cecilia Tortajada, from the Institute of Water Policy at the Lee Kuan Yew School of Public Policy, said that if the reservoir water levels do not improve by next month despite the north-east monsoon, which is expected to set in then, such restrictions may have to kick in. "It would send a clear message to the population that there is a limit to how much water is available and that it needs to be conserved, even after the monsoon season starts," she said, pointing out that many cities around the world enforce water restrictions during the dry season. The reservoir was built in 1994 by Singapore. It keeps sea water out of the Johor River by releasing water into it. This ensures that the river water is not too salty to be treated by the Singapore-run treatment plant there. PUB has been running desalination and Newater plants at high capacity to keep local reservoir stocks healthy. Currently, Singapore's four Newater plants can meet up to 30 per cent of the nation's water needs. PUB hopes to expand this to 55 per cent by 2060. PUB also aims to build two more desalination plants. Currently, desalination or treated sea water can meet up to 25 per cent of Singapore's needs. Professor Asit Biswas, distinguished visiting professor at the Lee Kuan Yew School of Public Policy at the National University of Singapore, said Singapore needs to think seriously about developing a long-term, drought-resistance plan. With climate change and multi-year droughts in countries like Australia, there is a very high probability that the region may be hit by a prolonged multi-year drought within the next two to four decades, and not just one lasting a few months, he said. He also added that Singaporeans may have taken a reliable water supply for granted, pointing out that water-rationing last took place here from April 1963 to February 1964. Prof Biswas said: "More than a generation has now grown up without having faced a serious drought needing water-rationing."